As I noted when DML released its M6A1 kit, in May 1940 the US Army contracted with Baldwin Locomotive Company to build the first US heavy tank since the Mark VIII International of 20 years earlier. The new tank was based on WWI thinking with only a few changes, and as such had a large and bulky hull design with a turret mounting both a 3" main gun and a 37mm antitank gun along with a .50 caliber machine gun at the rear and one on a flexible mounting. Two more moveable .50 caliber machine guns were mounted in the bow to the left of the driver and the driver himself had a pair of semi-fixed .30 caliber machine guns pointed forward (later reduced to one on the right). The tank was powered by a downrated Wright R-1820 Cyclone, called the G-200 in its ground version, and due to the power and torque of the engine it was fitted with a two-speed Hydramatic transmission (similar to the one used in busses). Three versions of four planned were built: T1E1, with a cast hull and Hydramatic and which later unofficially standardized as the M6A2 Heavy Tank (20 built); T1E2, with a cast hull and twin disk torque converter, standardized as the M6 Heavy Tank (8 built); and the T1E3, similar to the T1E2 but with a welded upper hull as the M6A1 Heavy Tank (12 built). Even before the tanks were built it was quickly recognized from reports of combat experience in Europe that the new heavy tank was woefully obsolete, overweight and insufficiently armored where it needed to be. 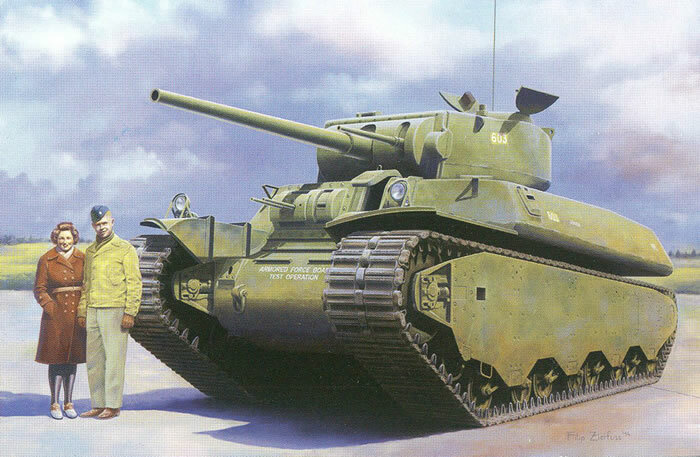 As a result, all 40 tanks became “orphans” and either spent their time performing at war bond rallies or as test “mules” at the Yuma Proving Ground in Arizona. After the war all save one M6 were scrapped, and that tank is currently no longer on display. DML released their M6A1 kit in July 2014 and nearly all reviewers noted the problems with the kit which apparently derived from the resin Commander Models kit. Unfortunately this kit uses 95% of the parts from that kit and thus perpetuates the dimensional errors. First and foremost is that the tracks are too wide. The actual tank had tracks listed as 25.75" wide or 18.7mm in 1/35 scale. The ones on the Commander kit worked out to 30" as per the instructions using two sets of after-market T49 tracks or 21.7 mm. The tracks on this kit - while newly molded as noted – are also 21.7mm. This is a shame, as the kit DOES have the proper road wheel design and very nice bogies. Most of the rest of the features of the kit are not too bad, and they fixed a number of the errors in the resin kit. It does come with an inner mantlet for the combination gun mount (which had to be scratchbuild with bent styrene and other annoying detail work on the Commander one). However, the M6 37mm gun is way too fine and is close to a 20mm gun in size which is a shame. The front hull glacis mantlet is nicely done and the driver’s viewer is included. But the machine guns are a bit anemic and do not look the part of proper “Ma Deuces”. It took me about two weeks of looking and checking and finally using a high grade image run through Photoshop Elements to see how the exhausts were mounted in the tank. The upper bar on the outside cells of the grill was removed and two trumpet-shaped exhaust horns projected down into the exhaust bay. The kit provides the complete grill but no exhaust tips. Much of the kit’s breakdown mirrors the resin kit. Each bogie consists of seven parts and also needs a mount to the hull. But here DML has four bogies attached to the hull and four to the outer skirting rather than each other (they were connected in real life). The turret at least is more conventional with a shell connecting to the base; the other one had the roof connecting to the shell which was a problematic fit. It does come with the HF antenna mount for command tanks properly molded and this attaches to the upper forward section of the hull. However, the .30 caliber tripod on the front right fender is missing. Also while the port is provided for the single .30 caliber gun remaining after testing (on the right front of the bow plate) no barrel is provided. There are two different finishes offered for this kit, both in olive drab. The choice is between the Armored Test Board, Fort Knox, 1942 (“Junior”, USA 3014361 - note that it was separated by commas in the peculiar style seen on some early war tanks, e.g. 3,014,361); or Fort Knox 1942 (reference number 8293). A small sheet of Cartograf decals is included. Overall, it is a shame that DML did not take the comments on the first kit to heart and modify the molds for this kit. But if you want one, this is the place to start as it is a much easier build and being styrene easier to correct.